2010 June 6 Steve Nguyen, Ph.D. Note: If you have trouble viewing the video, you can watch it on YouTube. 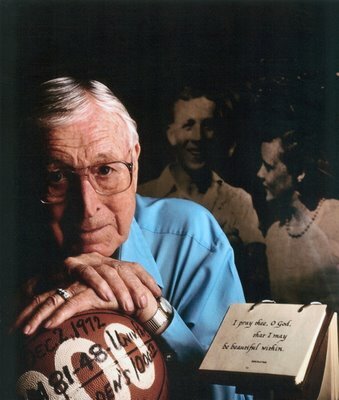 John R. Wooden, a well-respected, much beloved basketball coach, died June 4, 2010. He was 99 years old. His record ten NCAA national championships in 12 years while at UCLA is unparalleled by any other college basketball coach. Perhaps more than being remembered as one of the greatest coaches of all time (not only just in basketball) he was remembered as a great person. One thing he says he wanted to be remembered for is someone who is considerate of others. This post showcases two great videos featuring coach John Wooden. The first video (at top), highlights Wooden and his life as a devoted husband and man of strong convictions. In this second video (above) with Dr. Mick Ukleja of LeadershipTraQ.com, coach John Wooden shares his views on life and leadership. Recounting the lessons from his dad, he shares the important life and leadership lessons he’s learned over the years. Coach Wooden says one of the most important things he learned at a young age was to never try to be better than someone else, but always try to be the best you can be. Focus on those things you have control. No whining, no complaining, don’t make excuses. Self-Control – keeping your emotions under control so you can execute whatever it is that you’re doing. Alertness – observing the things around you and knowing the things to do and not do. Coach John R. Wooden was a humbled man and a consummate coach and teacher of life. Wooden, J. & Jamison, S. (2005). Wooden on leadership. New York: McGraw-Hill. Wooden, J. & Jamison, S. (2007). The essential Wooden: A lifetime of lessons on leaders and leadership. New York: McGraw-Hill.